Spin bowler Dean Cosker has paid tribute to the influence of Glamorgan coach Robert Croft on his bowling. 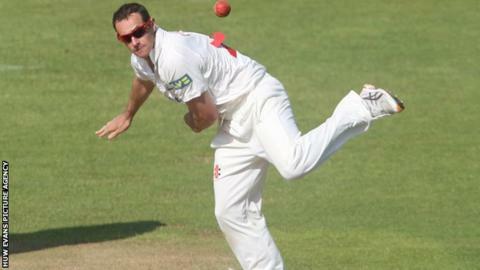 Cosker, 36, has already taken 14 wickets for Glamorgan so far this campaign. Former England spinner Croft is in his second season as bowling coach at the Swalec stadium. "Its nice to know the nice technical changes I have done with Crofty over the winter is beginning to pay off," said Cosker. "Hopefully, I can maintain this form come August and July. "It's nice to get the ball in your hands because we have had some nice weather in April and May. "It's nice to get some overs under your belt; I have bowled 18 overs, 29 overs, 22 overs in spells. "That is important for a spin bowler early on in the season. It gives you a chance to get into a rhythm." Cosker has hit a rich vein of form with Glamorgan, taking 5-39 in the first innings LV= County Championship Division Two clash against Worcestershire at the Swalec Stadium. His coach and former team-mate Croft retired from first class cricket at the end of the 2012 season, having played county cricket for Glamorgan for 23 seasons. The spin bowler played 21 Tests for England and was drafted into the Glamorgan coaching set up after his retirement. Croft, who retired from cricket in 2012, formed an impressive and enduring spin bowling partnership with Cosker at the Welsh County. Cosker, who will celebrate 20 years at Glamorgan in 2015, says he still has ambitions to play for England even at this late stage of his career. "You never stop learning in this great game, especially the art of spin bowling," said Cosker, who signed a new two-year deal with Glamorgan in 2013. "The game changes so fast, whether its Twenty20 or four-day championship stuff. "I still have England aspirations and in order for me to succeed for Glamorgan I need to be doing these technical changes. "It is more mindset, field-placings and a little technical work. "Hopefully it pays off now and later on in my career as well."